It is possible that you might face a life-threatening situation today – modern life is full of risks from crossing the road, to being involved in a large-scale terrorist attack. How would you react? Could your reactions influence your chances of survival? Or is survival just down to luck? It is true that some factors affecting your survival, such as blocked fire exits or the lack of working safety equipment are out of your personal control. However, it is also true that individual psychological and physiological responses to threat can greatly influence your survival chances. This article considers what goes on in mind and brain when we strive to survive. When exposed to threat, people often fail to take actions that could improve their chances of survival. For example, during a simulated fire emergency in a tunnel, people stayed with their cars even when they were obscured by smoke (Boer, 2002). This failure to react has also been observed in real-world situations with partygoers at a disco failing to evacuate even when the building was filled with black smoke and there was a smell of burning (Cassuto & Tarnow, 2003). Why do some people fail to respond to such warning signs of a disaster? Interestingly, research has suggested that people who live in dangerous locations show a surprising lack of knowledge of the risks associated with their environment. Residents living near Mount St Helens, when surveyed during some volcanic activity, did not understand the risks associated with a volcanic eruption (Greene et al., 1981). On other occasions, people may fail to respond to threat due to denial behaviours. Denial can be psychologically protective, reducing anxiety as people distort warning signs to reassure themselves that they are not in danger. However, denial can also be dangerous as people may not acknowledge and respond to life-threatening situations. For example, prior to the Ash Wednesday bush fires in Australia clear warning signs indicated a major fire was likely. The failure of residents to accept the potential risk led to limited evacuation and ultimately the loss of 72 lives (Valent, 1984). To suggest that people’s failure to recognise danger is the only reason for an untimely death is to oversimplify the problem. Even if people respond to the potential threat, survival is not guaranteed. Cognitive failures in emergency situations mean that actions taken can be ineffective at best and in some cases can actually reduce survival. During a fire in a Peruvian nightclub in Lima in 2002 the blaze was made worse by people throwing alcohol onto the flames. While this error may be attributable to a lack of training, inappropriate behaviours have also been observed in populations who are prepared for potential disasters. During the Iraqi missile attacks, 70 per cent of Israeli civilian hospital admissions were as a direct result of inappropriate behaviours. People suffered injuries as a result of running into doors, and in some cases died from suffocation because they had not opened the filters on their gas masks (Karsenty et al., 1991). Explanations for why people carry out inappropriate actions during threat have been considered at a cognitive level. Research suggests that restrictions in both working memory capacity and processing may occur under threat (see Leach, this issue). This often arises from increases in anxiety (Robinson et al., 2008), reductions in processing time or the increased amount of novel stimuli (Leach, 2004, 2005). However, the role of physiological changes at a neurological level and their impact on cognitive functioning during threat is less well understood. One major obstacle to furthering our understanding of responses to disasters is the ethical and practical difficulties relating to data collection. Simulated emergency situations, such as evacuations from smoke-filled aircraft, allow us to overcome some of the problems associated with research using real-life disasters, such as predicting when a life-threatening emergency will take place. Our own research has explored changes in physiology and cognition in people undertaking helicopter underwater evacuation training (HUET). 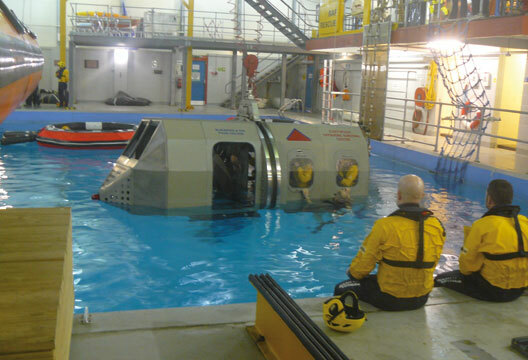 HUET involves the individual being seated in a mock-up of a helicopter suspended above a pool. The helicopter is then lowered, at speed, into the pool until it is submerged and participants either release their seat belts and exit via a window immediately or must wait until the helicopter is rotated 180 degrees before escaping. This controlled exposure to a mentally and physically stressful experience allows collection of psychological and physiological data. When people acknowledge that they are facing an emergency two main physiological systems are activated that are designed to enhance self-preservation (Selye, 1974). These are the sympathetic division of the autonomic nervous system (ANS) and the more slowly responding hypothalamic-pituitary-adrenal (HPA) axis. The role of these two systems is to prepare the body to cope with threat (Miller & O’Callaghan, 2002). The two response systems work by increasing certain hormones, such as adrenaline and cortisol. These, in turn, act on the biological functioning of the individual, such as increased heart rate, inhibition of the digestive system or increased glucose supply to the muscles. Although these physiological changes may be helpful for enhancing physical responses to threat, the associated neurochemical changes could actually reduce survival by negatively impacting on cognitive processes, such as memory or attention. Indeed, activation of the ANS and HPA axis has been shown to lead to fluctuations in certain types of neurochemicals and changes in regional cerebral blood flow (rCBF). For example, exposure to certain stressors can cause an increase in turnover and a decrease in the absolute level of catecholamine (CA) neurotransmitters and adrenaline (Thomas et al., 1999). Changes in catecholamine levels can have a major influence on the functioning of the prefrontal cortex and working memory. For example, high levels of dopamine and noradrenaline have been shown to impair working memory (Dollins et al., 1995), an area of cognition that is critical for responding to the unpredictability of a disaster situation. is released following activation of the HPA axis. The release of cortisol in people under threat results in a temporary increase in energy production at the expense of processes that are not required for immediate survival (Evans et al., 1994). Glucocorticoids such as cortisol in humans are able to cross the blood–brain barrier, and so can act directly on areas of the brain where glucose receptors are found in high densities. As a result, increases in levels of circulating cortisol have been found to be associated with decreases in activities pertaining to the frontal cortex (e.g. attention, working memory and inhibitory control: Lupien et al., 1999; Hoffman & al’Absi, 2004) and the hippocampus (declarative memory; Wolf et al., 2002). Anecdotal accounts from survival situations do suggest that these elements of cognitive functioning do become impaired during threat. When reporting a fire at Our Lady of Angels Catholic School in Chicago in 1958, a disaster that cost the lives of 93 people, including many children, the nun telephoning the fire brigade forgot the school address. Many similar examples exist to suggest that cognitive failures observed in survival situations may not be solely the result of external factors, such as reduced processing time. It is possible that cognitive performance failures during survival situations are underpinned by neurochemical changes. This raises the interesting question as to whether some people may have a predisposition for adverse responses during threat. For example, research into the neurotransmitter neuropeptide Y (NPY) in soldiers undergoing military survival training indicated that those soldiers who had higher levels of NPY displayed better behavioural responses and showed less distress following exposure to an uncontrollable acute stressor (Morgan et al., 2000). Furthermore the androgen steroid hormone dehydroepiandrosterone (DHEA), which is triggered by adrenocorticotropic hormone during stress exposure, has also been shown to be an important factor in how people tolerate exposure to stress. Research indicates that the ratio between DHEA and glucocorticoids appears to be an important factor in how people tolerate exposure to stress and the extent to which cognitive impairments are observed. A higher ratio between DHEA and cortisol seems to provide a buffer against damaging effects of stress and reduces the likelihood of people in survival situations experiencing cognitive deficits (Morgan et al., 2004). As a result, differences in neuroendocrine responses may explain why some people act in a calm and collected manner during an emergency whereas others go to pieces. of Maralyn and Maurice Bailey, who survived in a life raft for 117 days after their yacht sank in the Pacific Ocean. A person’s ability to survive a longer-term disaster will depend on sustaining motivation to cope and to adapt to new, often hostile, environments. As a result in survival situations where rescue is not immediately forthcoming the disaster victim may have to overcome cognitive dysfunction caused by extreme physical and psychological pressures in order to survive. Indeed factors such as physical fatigue have been shown to induce a broad spectrum of cognitive decrements (for example, see Lorist et al., 2005). People exposed to long-term survival situations may risk cognitive failures due to the increase in physical activity and the decrease in rest or food. As the brain is very sensitive to the level of glucose supply, even a mild reduction in the availability of glucose can result in interference with cerebral function (Gold et al., 1995). For example, participants taking part in fire-fighting training were found to have significant decreases in blood glucose levels and an associated reduction in cognitive performance (Smith et al., 2001). Reduction in blood glucose levels during survival situations coupled with adverse environmental factors can also affect cognition. Dehydration (Cian et al., 2000), moderate hypothermia (Ashcroft, 2000) and elevated temperature (Wright et al., 2002) have individually been shown to lead to reductions in cognitive performance. Even simple factors such as the removal of access to coffee and cigarettes can potentially influence survival chances. The withdrawal of nicotine, for example, has been shown to have negative effects on cognition in people who have a nicotine dependency (Xu et al., 2005). Further, withdrawal of caffeine is associated with feelings of fatigue and decreased feelings of alertness (Schuh & Griffith, 1997). Survivors such as US miners reported that they became desperate for coffee and cigarettes within a day of becoming trapped in a rock fall. These observations suggest that a person’s survival chances can be impacted by challenging environmental factors. However, it is difficult to predict the full impact of an adverse environment on cognition as factors such as dehydration, glucose restriction and drug withdrawal, are rarely studied in combination. Longer-term survival, such as surviving an extended stay in a hostile environment, can be aided by structural alteration in the brain. In particular, neurogenesis in the hippocampal regions can lead to modification of spatial learning and memory to meet the demands of a new environment (Simon & Gorman, 2004). However, if repeated stress persists over a long period of time, neuronal damage and death can occur in vulnerable cell populations. As a result prolonged stress may alter neural plasticity leading to some behavioural abnormalities, which could reduce survival. In addition, exposure to repeated stressors can lead to problems such as depression and anxiety (Radley & Morrison, 2005), clearly not helpful in a survival situation. Cognitive problems experienced by disaster victims might not be over upon rescue. Interestingly, people who have remained cognitively well-adjusted during threat may well show impairments on rescue. One case is that of Lauren Elder, who was on board a plane that crashed in the High Sierra in California, was able to climb down a snow-covered mountain and trek across the wilderness to safety. However, upon rescue she reported that she fell into a stupor. She reported that ‘words whirled about me and I could not absorb them all’. Observations of survivors during the rescue phase indicated that some victims acted dazed, withdrawn and are relatively immobile or if they moved, they did so in an aimless and distracted way. It has also been noted by medical staff that survivors were often suggestible and passive (Baker & Chapman, 1962). The reasons why survivors might suffer from a collapse in cognitive functioning upon rescue are not understood and there is little research into this phenomenon. Generally, the physical and mental demands placed on individuals during rescue are low. If victims display cognitive impairments in this period these can be monitored by rescuers and medical staff and interventions administered if required. However, it is also important for the emergency services to be aware that after a major incident, individuals who appear to be functioning normally may well suffer from cognitive impairments a short time later. Therefore, extra care should be taken if, for example, a victim is being placed in a potentially dangerous situation such as being transported via helicopter to hospital. Acceptance of a potential risk and being prepared for a disaster by having a well-stocked survival kit can stop environmental pressures such as cold or lack of food from impacting on cognition and so can improve your chances of survival. This is not second nature to us, either because of denial or not fully understanding the risks. The Californian North Ridge earthquake in 1994 revealed many people had put themselves at increased risk by not having an earthquake survival kit. If cognitive and physiological changes under threat lead to a reduction in cognitive functions such as working memory, then utilisation of areas of the brain that are more likely to be unaffected by exposure to stressful events would be useful. For example, training that reduces the burden on working memory by laying down procedural memories on how to use safety equipment could help lead to purposeful action during an emergency. This highlights the need for safety training to incorporate a practical element, not just to rely on reading a book or watching a video. Ashcroft, F. (2000). Life at the extremes: The science of survival. Berkeley, CA: University of California Press.Baker, G.W. & Chapman, D.W. (Eds) (1962). Man and society: In disaster. New York: Basic Books. Boer, L.C. (2002). Behaviour by motorists on evacuation of a tunnel. TNO Human Factors report TM-020-CO34. Cassuto, J. & Tarnow, P. (2003). The discotheque fire in Gothenburg 1998. Burns, 29, 405–416. Cian, C., Barraud, P.A., Melin, B. & Raphel, C. (2001). Effects of fluid ingestion of cognitive function after heat stress or exercise-induced dehydration. International Journal of Psychophysiology, 42(3), 243–251. Dollins, A.B., Krock, L.P., Storm, W.F. et al. (1995). L-tyrosine ameliorates some effects of lower body negative pressure stress. Physiological Behaviour, 57, 223–230. Evans, P., Bristow, M., Hucklebridge, F. et al. (1994). Stress, arousal, cortisol and secretory immunologlobulin A in students undergoing assessment. British Journal of Clinical Psychology, 32, 227–236. Gold, A.F., Deary, I.J., MacLeod, K.M. & Frier, B.M. (1995). The effect of IQ level on the degree of cognitive deterioration experienced during acute hypoglycemia in normal humans. Intelligence, 20, 267–290. Greene, M., Perry, R. & Lindell, M. (1981). The March 1980 eruptions of Mount St Helens. Disasters, 5, 49–66. Karsenty, E., Shemer, J. & Alshech, I. (1991). Medical aspects of the Iraqi missile attacks on Israel. Israel Journal of Medical Science, 27, 603–607. Leach, J. (2004). Why people ‘freeze’ in an emergency. Aviation, Space and Environmental Medicine, 75, 539–542. Leach, J. (2005). Cognitive paralysis in an emergency. Aviation, Space and Environmental Medicine, 76, 134–136. Lorist, M.M., Boksem, M.A.S. & Ridderinkhof, K.R. (2005). Impaired cognitive control and reduced cingulate activity during mental fatigue. Cognitive Brain Research, 24(2), 199–205. Lupien, S.J., Gillin, C.J. & Hauger, R.L. (1999). Working memory is more sensitive than declarative memory to the acute effects of corticosteroids. Behavioural Neuroscience, 113, 420–430. Miller, D.B. & O’Callaghan J.P. (2002). Neuroendocrine aspects of response to stress. Metabolism, 51, 5–10. Morgan, C.A. III, Wang, S., Southwick, S.M. et al. (2000). Plasma neuropeptide-Y concentrations in humans exposed to survival training. Biological Psychiatry, 47, 902–909. Morgan, C.A. III., Southwick, S., Hazlett, G. et al. (2004). Relationships amongst plasma dehydroepiandrosterone sulfate and cortisol levels, symptoms of dissociations, and objective performance in humans exposed to acute stress. Archives of General Psychiatry, 61, 819–825. Robinson, S.J., Sunram-Lea, S., Leach, J. & Owen-Lynch, P.J. (2008). The effects of exposure to an acute naturalistic stressor on workingmemory, state anxiety and salivary cortisol concentration. International Journal on the Biology of Stress, 11, 115–124. Schuh, K.J. & Griffith, R.R. (1997). Caffeine reinforcement. Psychopharmacology, 30, 320–326. Selye, H. (1974). Stress without distress. New York: New American Library. Simon, A. & Gorman, J. (2004). Psychopharmacological possibilities in the acute disaster setting. Psychiatric Clinics of North America. 27, 425–458. Smith, D.L., Petruzzello, S.J., Chludzinski, M.A. et al. (2001). Effects of strenuous live-fire fighting drills on hematological, blood chemistry and psychological measures. Journal of Thermal Biology, 26, 375–379. Thomas, J.R., Lockwood, P.A., Singh, A. & Deuster, P.A. (1999). Tyrosine improves working memory in a multitasking environment. Pharmacology, Biochemistry and Behaviour, 64(3), 495–500. Valent, P. (1984). The Ash Wednesday bushfires in Australia. Medical Journal of Australia, 14, 291–300. Wolf, O.T., Schommer, N.C., Hellhammer, D.H. et al. (2002). Moderate psychosocial stress appears not to impair recall of words learned 4 weeks prior to stress exposure. Stress, 5(1), 59–64. Wright, K.P, Hull, J.T. & Czeisler, C.A. (2002). Relationship between alertness, performance and body temperature. American Journal of Regulatory Integrative and Comparative Physiology, 283, 1370–1377. Xu, J., Mendrek, A., Cohen, M.S. et al. (2005). Brain activity in smokers performing a working memory task. Biological Psychiatry. 58(2), 143–150. Who makes a good companion?